How is AI Discovering Extinct Human Relatives? Over centuries, thanks to advances in science and technology, we have been piecing together the story of our own human evolution. The twists and turns in the story of our origins have made headlines for quite a while now, but when brand new technology gets involved the discoveries become even more remarkable! How is AI discovering extinct human relatives? Listen to this Question Your World radio report produced by the Science Museum of Virginia to learn more. Algorithms are certainly a part of our lives in many different ways. Smart algorithms manage our social media feeds, bring us financial forecasts, and can even help us find our future partners to make future generations of humans. Recently, scientists used Artificial Intelligence, AI deep learning algorithms, to more accurately identify past generations of humans. In fact its even identified a never before documented ancestor! So, how does this fancy new tech work? The creators of this AI say it was designed after the mammalian brain, to go through each line of data at a time to do comparative analysis. This algorithm systematically goes through a chosen specimen’s genome and cross references it with hundreds of thousands of variables of data obtained by scientists. These variables trace back where genetic information would have been exchanged and thus helps narrow down the genetic history of our species. 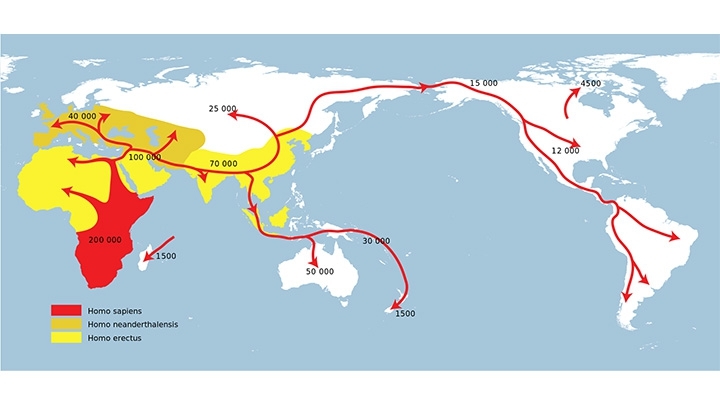 From this first attempt they have identified a new ancestor who would have been a result of Neanderthals and Denisovans hybrid which cross bred with an out of Africa hominid while in Asia. We’ve known about humans cross breeding with Denisovans and neanderthals, but this is the first time an extinct third species has been introduced into our story of human evolution, largely thanks to this algorithm. Now that this algorithm has been used it opens up the door to mapping other specimen’s genetic histories to get a very accurate and more complete understanding of our own human evolution. Like most other things involving humans, putting together our own past is a complex and messy process, but hopefully with smarter technology this ongoing process can become a little more accurate. Beyond humans this technology could also help identify similar findings for the many other species on Earth as well. So yeah the wonders of algorithm technology, from human history to human hook ups, past and present.